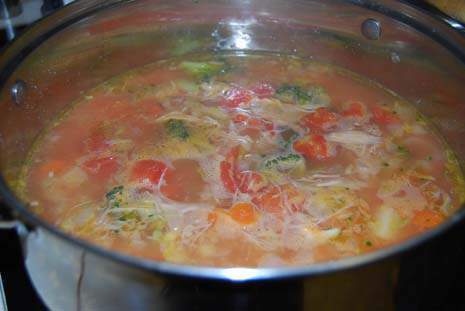 If you don’t know what to do with all the leftover turkey each year from Thanksgiving here is a recipe that you can make for your freezer to have turkey soup later in the winter. This recipe is easy to do the day after Thanksgiving. Here is how I make up my turkey soup kits. Take your carcass of your turkey and put it into your crock pot. Then add a few pieces of cut up celery, onion and a carrot or two. Fill the crock pot two thirds full with water and then set to low to cook overnight. 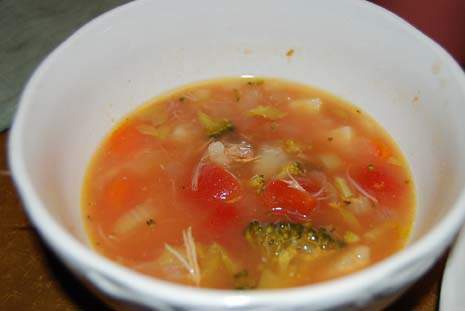 In the morning strain the broth into a bowl and cool in the refrigerator. Discard the bones and vegetables. 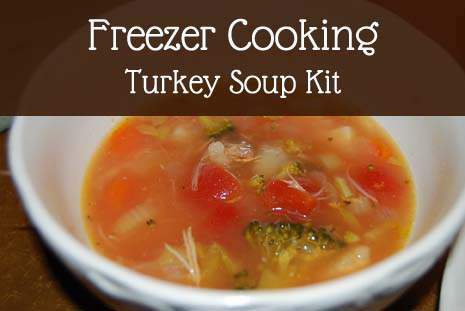 Once the broth is cooled put 1 to 1 1/2 cups of diced leftover turkey into your freezer container. I use quart sized containers that are square in shape and they seem to work really well. Then fill the rest of the container with broth. Make sure to leave a little headspace for expansion. Then freeze. 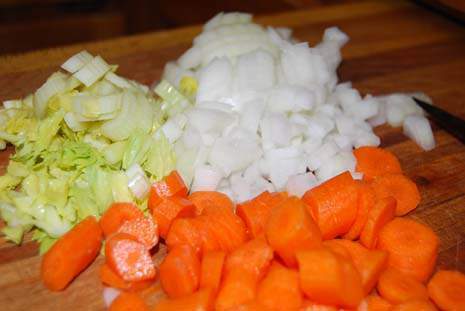 Later in the season when you want to make soup dice up one onion, 3-4 stalks of celery, 2-3 carrots sliced, and 2-3 potatoes. 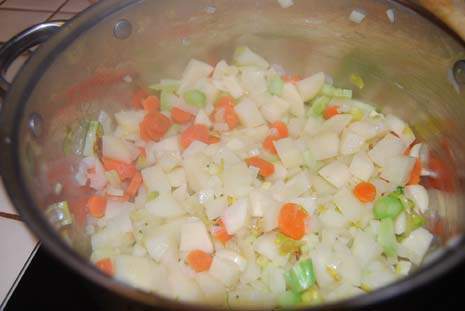 Add a tablespoon of oil to a stock pot or large pot and then add the vegetables. Cook for about 5 minutes. Once vegetables have cooked a little. Add the broth and turkey. As you can see from my pictures below, my broth and turkey didn’t thaw very much. 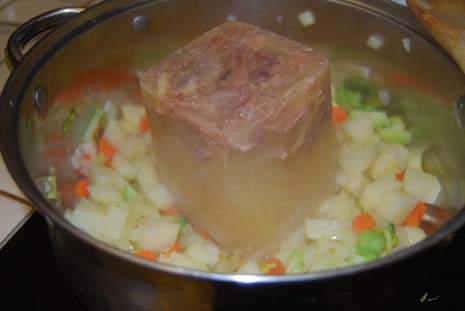 So I added about 1 cup of water to the vegetables and then added the turkey/broth frozen block. I cooked this on medium until the block of broth had thawed all the way and then I simmered it until the vegetables were soft. I added a can of diced tomatoes and some salt and pepper to taste, along with 1 teaspoon of thyme and parsley. This makes a really hearty soup. I usually will serve it with some biscuits or breadsticks and some fruit to finish out the meal. Leave out the potatoes and add some pasta in the last 12 minutes of cooking time. 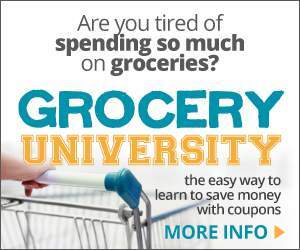 Use different vegetables or the vegetables you have on hand. I added some broccoli because I had some. 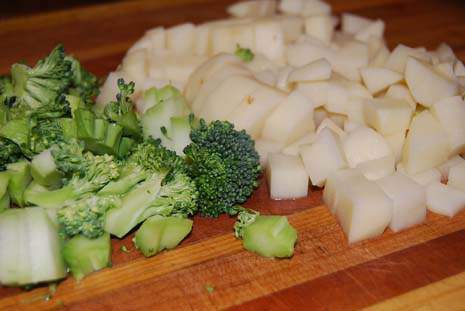 Use frozen vegetables to make the soup even easier to make. Mmm…this soup looks delicious! I will have to try making the broth this year in my crockpot like you suggest. It sounds very easy to set up before you go to bed. Thanks for the great recipe and tips! Erin, I hope your family will enjoy it. This year we are smoking our turkey in our wood BBQ so we will get to have smoked turkey soup. I did this one year in the past and it was so good. Looks delicious, Shelly! I pinned this post to try your recipe later. 🙂 Thanks for sharing! Thanks for pinning the post Sandra. I do hope you and your family enjoy it. Shelly, I made the broth a few days ago, and made the soup last night for dinner and it was SO good! I love how it was super easy to make and used a lot of leftovers from my fridge. Erin, Glad to hear it turned out so good for you. I love to make soup this time of year. It makes it easy to use up the leftovers and you also get a unique soup each time.